Scholars have long recognized the media’s role in shaping and reflecting the way we see the world, ourselves, and others. In particular, they have understood that the media plays a vital part in the social and cultural construction of disability. Moreover, as new types of media proliferate, and become increasingly important in our daily lives, addressing the sometimes difficult questions surrounding the relationship between disability and the media is more important than ever. In particular, what is the media’s role in the disablement of people with impairments and can it also act as a powerful agent of change? And how are attitudes towards people with disabilities constantly reinscribed through media such as television, film, and the Internet? 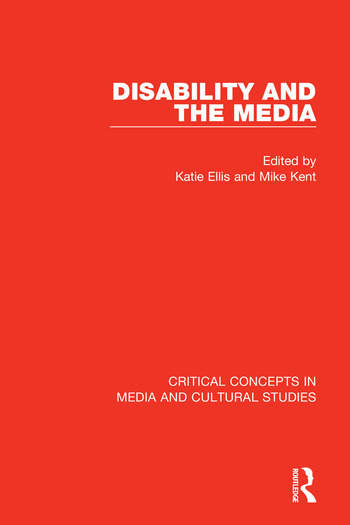 Now, this new four-volume collection from Routledge’s acclaimed Critical Concepts in Media and Cultural Studies series enables users readily to access and make sense of the essential texts of disability-and-media scholarship. The collection is organized into four principal parts: Disability and the Mass Media; Disability and Film; Disability and Popular Culture; and Disability, the Internet, and New Media. Fully indexed and with an introduction newly written by the editors, Disability and the Media is an indispensable reference resource for researchers and students. 1. M. Johnson and S. Elkins, Reporting on Disability: Approaches and Issue. Section II: Trends and Issues, (LY: Advocado Press, 1989), pp.40-57. 3. David Hevey, ‘The Creatures Time Forgot: Into the Grotto of Charity Advertising’, in The Creatures Time Forgot, (London: Routledge, 1992), pp. 18-29. 4. J. Clogston, ‘Disability Coverage in American Newspapers’, in Jack A. Nelson (ed. ), The Disabled, the Media, and the Information Age, (CN: Greenwood Press, 1994), pp. 45-57. 5. B. Haller, ‘If They Limp, They Lead? News Representations and the Hierarchy of Disability Images’, in Dawn Braithwaite and T. Thompson (eds. ), Handbook of Communication and People with Disabilities, (NJ: Lawrence Erlbaum, 2000), pp. 225-237. 6. D. Mitchell and S. Snyder, ‘Chapter 1: Representation and its Discontents: The Uneasy Home of Disability in Literature and Film’, in Narrative Prosthesis: Disability and the Dependencies of Discourse, (MI: The University of Michigan Press, 2000), pp. 15-46. 7. Brian J. Sweeney and Sheila Riddell, ‘Mainstreaming Disability on Radio 4’, in Sheila Riddell and Nick Watson (eds. ), Disability, Culture and Identity, (New York: Routledge, 2003), pp. 143-160. 8. D. Parashar and N. Devanathan, ‘Still Not in Vogue: The Portrayal of Disability in Magazine Advertising’, Journal of Applied Rehabilitation Counselling, 37, 1, 2006, pp.13-20. 10. M. P. O’Malley, ‘Voices of Disability on the Radio’, International Journal of Language & Communication Disorders, 43, S1, 2008, pp.18-29. 11. P. Wilkinson and P. McGill, ‘Representation of People with Intellectual Disabilities in a British Newspaper in 1983 and 2001’, Journal of Applied Research in Intellectual Disabilities, 22, 1, 2009, pp.65-76. 12. S. Jones and V. Harwood, ‘Representations of Autism in Australian Print Media’, Disability and Society, 24, 1, 2009, pp.5-18. 13. E. Briant, N. Watson and G. Philo, ‘Reporting Disability in the Age of Austerity: The Changing Face of Media Representation of Disability and Disabled People in the United Kingdom and the Creation of New "Folk Devils"’, Disability & Society, 28, 6, 2013, pp. 874-889. 14. G. Philo, J. Secker, S. Platt, L. Henderson, G. McLaughlin and J. Burnside, ‘The Impact of the Mass Media on Public Images of Mental Illness: Media Content and Audience Belief’, Health Education Journal, 53, 1994, pp.271-81. 15. K. Ross, ’All Ears: Radio, Reception and Discourses of Disability’, Media, Culture & Society, 23, 4, 2001, pp.419-473. 17. T. Titchkosky, ‘Disability in the News: A Reconsideration of Reading’, Disability & Society, 20, 6, 2005, pp.655-668. 18. L. Zhang and B. Haller, ‘Consuming Image: How Mass Media Impact the Identity of People with Disabilities’, Communication Quarterly, 61, 3, 2013, pp.319-334. 19. S. B. Kamenetsky et al., ‘Eliciting Help Without Pity: The Effect of Changing Media Images on Perceptions of Disability’, Journal of Social Work in Disability & Rehabilitation, 2015, pp.1-21. 20. Joseph D. Keefer and Michael R. Smith, ‘Newspaper Employment of Journalists with Disabilities’, Newspaper Research Journal, 13 & 14, 4 & 1, 1992, pp.40-49. 21. Charles A. Riley II, ‘Chapter Seven: We: The Short Happy Life of an Independent Magazine’, in Disability and the Media, (NH: University Press of New England, 2005), pp. 157-195. 22. C. Jones, ‘Why This Story Over a Hundred Others of the Day? Five Journalists’ Backstories About Writing Disability in Toronto’, Disability & Society, 29, 8, 2014, pp.1206-1220. 23. M. Sgroi, ‘"I Should At Least Be Given a Chance to Try": The Experience of Media Workers with Disabilities in the United States during Postsecondary Education and Early Career’, Disability & Society, 31, 1, 2016, pp.64-83. 24. P. Longmore, ‘Screening Stereotypes: Images of Disabled People in Television and Motion Pictures’, in A. Gartner and T. Joe (eds. ), Images of the Disabled, Disabling Images, (NY: Praeger, 1987), pp. 65-78. 25. O. Farnall and K. Smith, ‘Reactions to People with Disabilities: Personal Contact Versus Viewing of Specific Media Portrayals’, Journalism and Mass Communication Quarterly, 76, 4, 1999, pp.659-672. 26. J. Valentine, ‘Disabled Discourse: Hearing Accounts of Deafness Constructed Through Japanese Television and Film’, Disability & Society, 16, 5, 2001, pp.707-721. 27. R. Mallett, ‘Choosing "Stereotypes": Debating the Efficacy of (British) Disability-Criticism’, Journal of Research in Special Educational Needs, 9, 1, 2009, pp.4-11. 28. M. Norden, ‘Chapter 1: Emergence of An Impoverished Image’, in The Cinema of Isolation: A History of Physical Disability in the Movies, (NJ: Rutgers University Press, 1994), pp. 14-48. 29. T. Shakespeare, ‘Art and Lies? Representations of Disability on Film’, in M. Corker and S. French (eds. ), Disability Discourse, (UK: Open University Press, 1999), pp. 164-172. 30. Sallie Baxendale, ‘Epilepsy at the Movies: Possession to Presidential Assassination’, The Lancet Neurology, 2, 12, 2003, pp.764-70. 31. D. S. Knight, ’Madness and Disability in Contemporary Chinese Film’, The Journal of Medical Humanities, 27, 2, 2006, pp.93-103. 32. S. Snyder and D. Mitchell, ‘Body Genres: An Anatomy of Disability in Film’, in S. Chivers and N. Markotić (eds. ), The Problem Body: Projecting Disability on Film, (OH: The Ohio State University Press, 2010), pp. 179-206. 33. M. Davidson, ‘Phantom Limbs: Film Noir and the Disabled Body’, in S. Chivers and N. Markotić (eds. ), The Problem Body: Projecting Disability on Film, (OH: The Ohio State University Press, 2010), pp. 43-66. 34. G. Cumberbatch and R. Negrine, ‘Part II: The Portrayal of People with Disability on Television: A Commentary’, in Images of Disability on Television, (London: Routledge, 1992), pp. 87-121. 35. K. Ross, ‘But Where’s Me In It? Disability, Broadcasting and the Audience’, Media, Culture & Society, 19, 4, 1997, pp.669-677. 36. K. LeBesco, ‘Disability, Gender and Difference on The Sopranos’, Women‘s Studies in Communication, 29, 1, 2006, pp.39-59. 38. P. Longmore, ‘The Cultural Framing of Disability: Telethons as a Case Study’, PMLA, 120, 2, 2005, pp.502-08. 39. R. McRuer, ‘Chapter 5: Crip Eye For the Normate Guy: Queer Theory, Bob Flannagan and the Disciplining of Disability Studies’, in Crip Theory: Cultural Signs of Queerness and Disability, (NY / London: New York University Press, 2006), pp. 171-198. 40. R. Belt, ‘"And Then Comes Life": The Intersection of Race, Poverty, and Disability in HBO’s The Wire’, Rutgers Race and the Law Review, 13, 2, 2012, pp.1-28. 41. S. Walters, ‘Cool Aspie Humor: Cognitive Difference and Kenneth Burke’s Comic Corrective in The Big Bang Theory and Community’, Journal of Literary and Cultural Disability Studies, 7, 3, 2013, pp.271-288. 42. B. J. Bond, ‘Physical Disability on Children’s Television Programming: A Content Analysis’, Early Educational Development, 24, 3, 2013, pp.408-418. 43. G. Goggin and C. Newell, ‘Chapter 5: Getting the Picture on Disability: Digital Broadcasting Futures’, in Digital Disability: The Social Construction of Disability in New Media, (MD: Rowman and Littlefield Publishers Inc., 2003), pp. 89-108. 44. M. Quinlan and B. Bates, ‘Dances and Discourses of (Dis)Ability: Heather Mills’s Embodiment of Disability on Dancing with the Stars’, Text and Performance Quarterly, 28, 1-2, 2008, pp.64-80. 45. E. Ellcessor, ‘Captions On, Off, on TV, Online: Accessibility and Search Engine Optimization in Online Closed Captioning’, Television & New Media, 13, 4, 2012, pp.329-352. 46. F. Utray et al., ‘Monitoring Accessibility Services in Digital Television’, International Journal of Digital Multimedia Broadcasting, 2012, pp.1-9. 48. R. Bogdan and D. Biklen, ‘Handicapism’, Social Policy, 7, 1977, pp.14-19. 49. E. Goffman, ‘‘Stigma and Social Identity’ ,in Stigma: Notes on the Management of Spoiled Identity, (NY: J. Aronson, 1974), pp. 1-40. 50. R. Garland-Thomson, ‘Chapter 1: Introduction’, in Freakery: Cultural Spectacles of the Extraordinary Body, (NY: New York University Press, 1996), pp. 1-19. 51. D. Reeve, ‘Cyborgs, Cripples and iCrip: Reflections on the Contribution of Haraway to Disability Studies’, in D. Goodley, B. Hughes and L. Davis (eds. ), Disability and Social Theory: New Developments and Directions, (UK: Palgrave Macmillan, 2012), pp. 91-111. 52. F. Kumari Campbell, ‘Chapter 1: The Project of Ableism’, in Contours of Ableism: The Production of Disability and Abledness, (NY: Palgrave Macmillan, 2009), pp. 3-15. 53. M. Oliver, ‘Chapter 5: The Structuring of Disabled Identities’, in The Politics of Disablement, (UK: Macmillan Education, 1990), pp.60-77. 54. T. Shakespeare, ‘Cultural Representation of Disabled People: Dustbins for Disavowal?’, Disability & Society, 9, 3, 1994, pp.283-299. 55. S. Snyder and D. Mitchell, ‘Chapter 1: Cultural Locations of Disability’, in Cultural Locations of Disability, (IL: The University of Chicago Press, 2006), pp. 3-36. 56. T. Siebers, ‘Chapter 3: What Can Disability Studies Learn From the Culture Wars?’, in Disability Aesthetics, (MI: University of Michigan Press, 2010), pp. 57-82. 57. David Bolt, ‘Social Encounters, Cultural Representation, and Critical Avoidance’, in N. Watson, A. Roulstone and C. Thomas (eds. ), Routledge Handbook of Disability Studies, (New York: Routledge, 2012), pp. 287-297. 58. C. J. Kokaska, ‘Disabled Superheroes in Comic Books’, Rehabilitation Literature, 45, 9/10, 1984, pp.286-88. 59. R. Garland-Thomson, ‘The Politics of Staring: Visual Rhetorics of Disability in Popular Photography’, in S. Snyder, B. J. Brueggmann and R. Garland-Thomson (eds. ), Disability Studies: Enabling the Humanities, (NY: The Modern Language Association of America, 2002), pp. 56-85. 60. R. Bogdan, ‘Chapter 4: Exotic and Aggrandized: Modes of Presenting Freaks’, in Freak Show: Presenting Human Oddities for Amusement and Profit, (IL: University of Chicago Press, 1990), pp. 94-118. 61. G. McKay, ‘Chapter 3: Corpus Crippus: Performing Disability in Pop and Rock’, in Shakin’ All Over: Popular Music and Disability, (MI: University of Michigan Press, 2013), pp. 87-119. 62. P. Kuppers, ‘Chapter 1: Practices of Reading Difference’, in Disability and Contemporary Performance, Bodies on Edge, (NY: Routledge, 2013), pp. 12-30. 63. K. Ellis, ‘Chapter 2: Our Moment in Time: The Transitory and Concrete Value of Disability Toys’, in Disability and Popular Culture: Focusing Passion, Creating Community and Expressing Defiance, (UK: Ashgate, 2015), pp. 15-35. 64. J. Dolmage and D. Jacobs, ‘Mutable Articulations: Disability Rhetorics and the Comics Medium’, in C. Foss, J. Gray and Z. Whalan (eds. ), Disability in Comic Books and Graphic Narratives, (UK: Palgrave Macmillan, 2016), pp. 14-28. 65. D. Peers, ‘Disempowering Paralympic Histories: Absent Athletes and Disabling Discourses’, Disability & Society, 24, 5, 2009, pp.653-665. 66. N. Carter and J. Williams, ‘"A Genuinely Emotional Week": Learning Disability, Sport and Television – Notes on the Special Olympics GB National Summer Games 2009’, Media, Culture & Society, 34, 2, 2012, pp.211-227. 68. A. Roulstone, ‘Enabling Technology: Disabled People, Work, and New Technology’, in Enabling Technology: The Benefits of New Technology, (UK: Open University Press, 1998), pp. 82-87. 69. G. Goggin and C. Newell, ‘The Business of Digital Disability’, The Information Society, 23, 3, 2007, pp.159-168. 70. G. Goggin, ’Chapter 5: Cellular Disability: Consumption, Design and Access’, in Cell Phone Culture: Mobile Technology in Everyday Life, (NY / London: Routledge, 2006), pp. 89-106. 72. G. Annable et al., ‘Accessibility, Disability, and Inclusion in Information Technologies: Introduction’, The Information Society, 23, 3, 2007, pp.145-147. 73. A. Foley and B. A. Ferri, ‘Technology for People, Not Disabilities: Ensuring Access and Inclusion’, Journal of Research in Special Education Needs, 12, 4, 2012, pp.192-200. 74. B. Wentz et al., ‘Retrofitting Accessibility: The Legal Inequality of After-the-Fact Online Access for Persons with Disabilities in the United States’, First Monday, 16, 11, 2013, http://firstmonday.org/ojs/index.php/fm/article/view/3666/3077. 76. K. Ellis and M. Kent, ‘Introduction: The Great Potential of Digital Technology’, in Disability and New Media, (NY: Routledge, 2011), pp. 1-10. 77. B. Haller, ‘Chapter 1: The Changing Landscape of Disability News: Blogging and Social Media Lead to More Diverse Sources of Information’, in Representing Disability in an Ableist World: Essays on Mass Media, (KY: Advocado Press, 2010), pp. 1-24. 79. D. Power et al., ‘German Deaf People Using Text Communication: Short Message Service, TTY, Relay Services, Fax, and E-mail’, American Anals of the Deaf, 152, 3, 2007, pp.291-301. 81. J. Cole et al., ‘GimpGirl Grows Up: Women with Disabilities Rethinking, Redefining, and Reclaiming Community’, New Media & Society, 13, 7, 2011, pp.1161-1179. 82. K. Best and S. Butler, ‘Disability and Communication: A Consideration of Cross-Disability Communication and Technology’, Disability Studies Quarterly, 2012, http://dsq-sds.org/article/view/3290/3179. 83. F. Ginsburg, ‘Disability in the Digital Age’, in H. Horst and D. Miller (eds. ), Digital Anthropology, (UK: Berg, 2012), pp. 101-126. 84. E. Ellcessor, ‘Chapter 2: You Already Know How to Use It: Technology, Disability and Participation’, in Restricted Access: Media, Disability, and the Politics of Participation, (New York: NYU Press, 2012), pp. 61-88. 86 M. Alper, ‘Augmentative, Alternative, and Assistive: Reimagining the History of Mobile Computing and Disability’, IEEE Annals of the History of Computing, 37, 1, 2015, pp.93-96.